With its lush tropical gardens, year-round summer weather and unique mix of cultures, Singapore had plenty to keep me entertained and amazed. But what about when mealtime rolled around? This equatorial Asian city-state is known as a culinary mecca, but that doesn’t always mean gluten-free visitors can partake. Though I did find many local dishes to be challenging, several fantastic meals kept me fueled for countless tropical adventures as I toured gluten-free Singapore. Starting my Singapore visit with a walk through the Gardens by the Bay was a wonderful way to soak in the city-state’s seamless blend of urban and natural spaces, and I recommend that you do the same. The Gardens by the Bay are home to several beautiful heritage gardens that boast a fascinating mix of tropical plants, along with enchanting environments like the Cloud Forest. I found myself completely mesmerized by this misty conservatory, where leafy ferns, waterfalls, colorful flowers and wispy clouds all thrive. The main attractions at the Gardens by the Bay are the Supertrees. 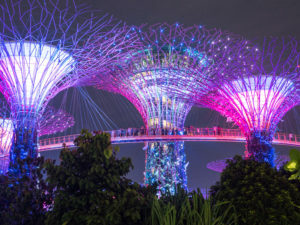 Some of Singapore’s most iconic structures, the gigantic Supertrees mimic tree forms and support growing vines, ferns and flowers along with an array of environmentally friendly solar panels. Visit in the evening, and you’ll see the Supertree grove come to life with a dazzling light and music show. 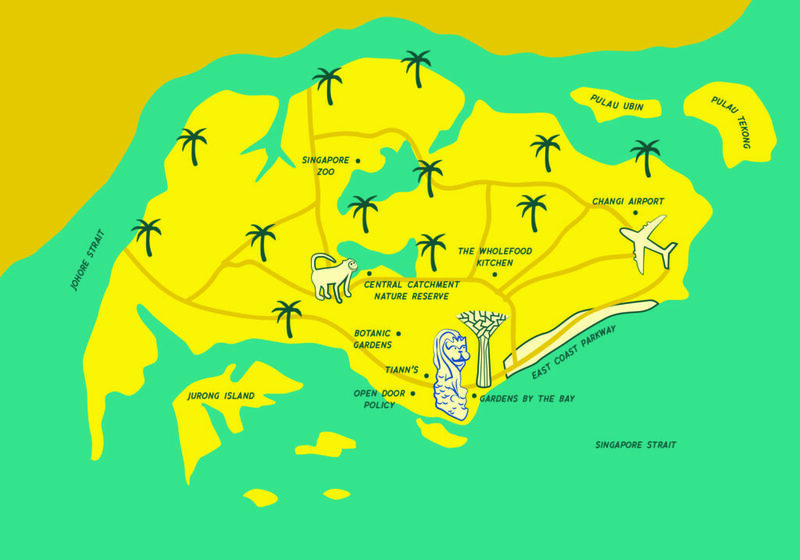 Leave the Supertree grove on foot, and you’ll find that Singapore’s cosmopolitan downtown is just a short stroll away. Although this waterfront area buzzes with activity at all times of day, it’s most lively in the evening, when you can walk along Marina Bay, catch the fountain show in front of the Marina Bay Sands and take a photo with the statue of the Merlion, Singapore’s one-of-a-kind mermaid-lion mascot. For most visitors to Singapore, tucking into a meal at one of the hawker centers is a major highlight. These popular outdoor food courts are scattered across the island, and they host vendors selling Singapore’s quintessential dishes. For gluten-free visitors, however, touring the hawker centers is more about observing the local culture and less about sampling countless dishes. Almost every stand is off-limits for gluten-free diners due to the omnipresent soy sauce, wheat noodles and language barriers. 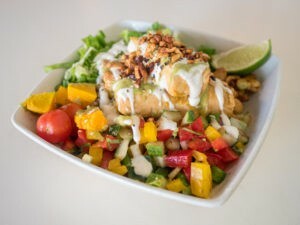 Be sure to try The Wholefood Kitchen’s most popular dish, the Heavenly Brown Rice Bowl With Lemongrass Ginger Tofu and Curried Cashew Nuts, which comes with savory, citrusy tofu topped with a zesty sauce, curried cashews and plenty of fresh veggies. Don’t forget to save room for one of Sanye’s incredible raw desserts, like the Strawberry Rosewater or Lavender Blueberry tart. These cool treats are the perfect antidote to Singapore’s steamy weather. After a fantastic meal, I recommend delving into Singapore’s culture with a visit to a couple of the island’s many museums and heritage centers. The National Museum of Singapore, for instance, has enough history and artifacts to fill an entire afternoon. Not only is this the nation’s oldest museum, but it’s also the best place to learn about Singapore’s history, including its early days; its existence under British, Japanese and Malaysian rule; and how it has thrived in its independent state. Offering an intoxicating mix of Asian art and historical exhibitionshe Asian Civilisations Museum is also well worth a visit. You can see everything from a ninth-century shipwreck to contemporary art here, and you’ll also learn how Singapore has long held a prominent role in the dispersal of ideas, languages and cultures throughout Asia. Singapore is truly a melting pot of Malaysian, Chinese, Indian and British cultures, and there’s no better way to find out more than with a tour of the various heritage centers. Visits to the Indian Heritage Centre, the Malay Heritage Centre and the Peranakan Museum also give you an opportunity to wander through the surrounding neighborhoods, where you can experience the culture firsthand. Once you’ve gotten your fill of culture, turn just west of Singapore’s main museum hub, where you’ll find Tiann’s bakery. This welcoming spot is completely gluten free, and it’s the perfect place to grab lunch or an afternoon treat. If you have as much of a sweet tooth as I do, you’ll let the case of beautiful tarts, cakes and bars lure you in. Once you see the full menu, you’ll want to sit down for a complete meal. While Tiann’s serves plenty of brunch classics and savory waffles, I couldn’t resist the Korean dishes on the menu, especially since they would typically contain gluten in other settings. I liked Grandma’s Bibimbap—which comes with sesame-toasted veggies, savory kimchi and housemade Korean red chili paste—so much that I ordered it on multiple visits. 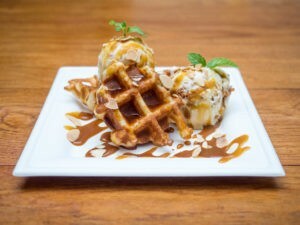 Of course, you can’t leave without trying Tiann’s waffles with gelato, both of which are made in house. After spotting numerous gluten-containing versions of this sweet treat during my visit, I was thrilled to get to try Tiann’s offering. It’s perfect for sharing, as it comes with two mini waffles and scoops of mouthwatering strawberries and cream and coconut maple cookie gelato. The sweet toffee sauce drizzled on top is quite literally icing on the cake. After such an indulgent treat, you’ll need to walk it off, and the beach is the ideal destination. I found that the best beaches in Singapore aren’t designed for swimming. Instead, they’re made for strolling along the boardwalk and taking in the ocean views. I can’t say enough about East Coast Park, a forested beach with a boardwalk that stretches for several miles along the island’s east coast. While this is a gorgeous place to see the sunrise, it’s really wonderful any time you want to take a long, leisurely walk under the shady coconut palms, inhale the sea breeze or watch the boats in the distance. 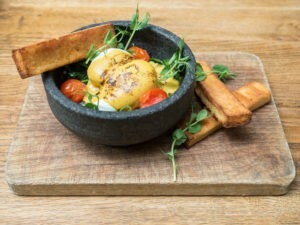 Singapore is big on weekend brunch, and for gluten-free diners, there’s a clear winner: Open Door Policy. This café turns sustainable dining into serious fun. The moment you step inside, you’ll feel like you walked into an enclosed garden, thanks to the myriad herbs and greens growing on the walls and the numerous skylights overhead. Everything on the menu is free of both gluten and dairy, which means there are no wrong choices here. After brunch, the lush Singapore Botanic Gardens is the perfect place to unwind. For more than 150 years, this stunning spot has welcomed visitors and locals alike to immerse themselves in natural beauty. The moment you walk through the gates, you’ll be transported to another world, and you’ll quickly get lost among more than 10,000 plants, including palms, orchids, ferns and much more. A large portion of the garden is a UNESCO World Heritage site, and as you wind your way along the paths, you can take detours to explore everything from heritage trees to rainforests to ginger gardens to ponds overflowing with water lilies. 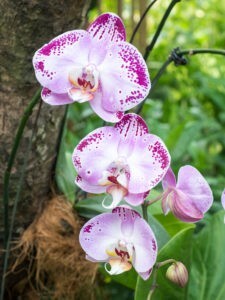 Tucked inside, you’ll also find the National Orchid Garden, a jaw-droppingly gorgeous area that’s dedicated to orchids of all shapes, sizes and colors. Although the botanic gardens make for a lovely tropical escape, Singapore has much more to offer if you’re looking for something a bit more wild—or if you really need to work off that brunch. In fact, the island is home to an extensive network of national parks and nature reserves, many of which offer hiking opportunities that range from easy to difficult with chances to spot wildlife. If you really want to get off the beaten path, be sure to visit the Central Catchment Nature Reserve, a massive green space located in the middle of the island nation. It spans about 5,000 acres and has everything from thick forest growth to freshwater swamps to centuries-old original forest cover. While much of this nature reserve seems relatively wild, it’s home to miles and miles of neatly planned trails and boardwalks that let you wind through the tropical forest. Whatever you do, don’t miss the TreeTop walk, where you can conquer your fear of heights on an 820-foot suspension bridge high above the forest floor. After completing that challenge, you deserve Tiann’s housemade waffles and gelato or a cool raw dessert from The Wholefood Kitchen.